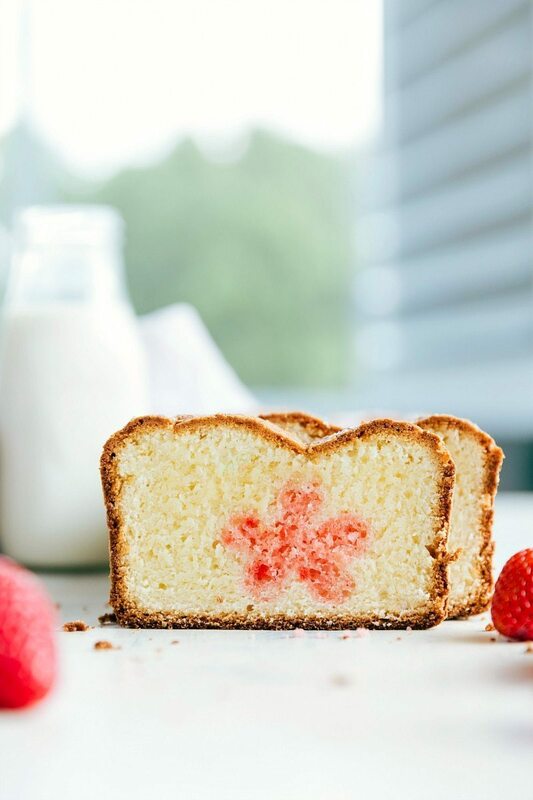 Cut into this delicious butter pound cake to find a surprise strawberry cake flower. 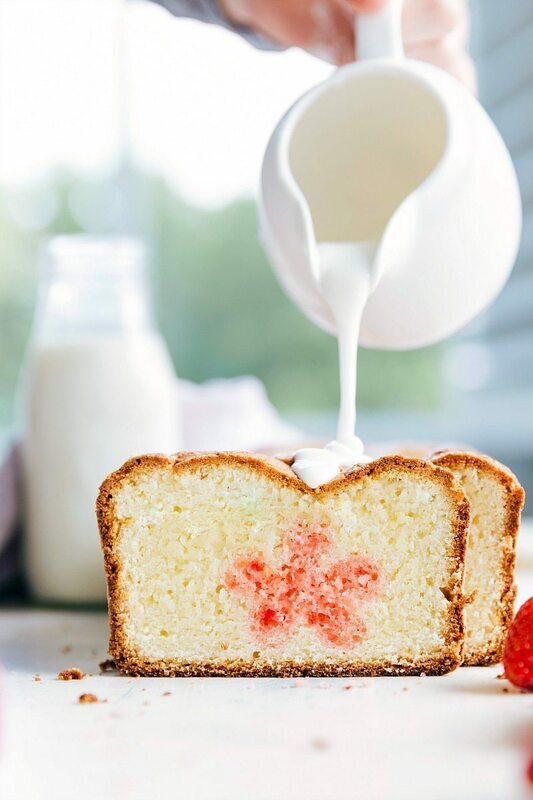 Mother’s Day is coming up and this pound cake is the perfect dessert slash breakfast or brunch for the day. I made a red-velvet heart stuffed pound cake back in February, which would also be great for Mother’s Day, but I thought it would be fun to change things up a bit and make it a little more Spring-ish. These cakes are a bit time consuming, but they are pretty simple to make. Quick overview: you’ll make a strawberry cake and let it cool. 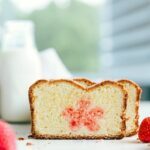 Once that is cool, you’ll cut out flower shapes and then put those flower shapes into a bread pan along with the next cake mixture — an easy butter pound cake. SMALL and well shaped flower cookie cutter: if the flower cookie cutter is too large, the outside pound cake won’t bake evenly. It’s also important you have a very “distinct” flower shape so it can be easily recognized as a flower. The more intricate the flower design, the less it will look like a flower in the end. Here’s a link to the exact cookie cutter I use for this cake. Very little pound cake at the bottom: put very little batter on the bottom — just enough to hold the cut out flowers in place. Pack the flower cut-outs tightly: Pack as many flower cut outs into the bread pan as possible. They should go from one side to the next and have no space in between. Freeze the inside cake: It’s so much easier to cut out shapes from a frozen cake. I also freeze the cut out pieces before putting them into the second pound cake. Preheat the oven to 350 degrees F. Prepare the cake mix according to package directions. Grease and flour the bottom only of a loaf pan and bake for 35 to 55 minutes depending on the pan size. One 9x5 loaf pan will be very full and will bake for 50 minutes (or more). You can use two 8x4-inch pans and start checking for doneness at around 35 minutes. Alternatively you can bake the cake in a 9 x 13 pan. Bake the cake and then let it cool for about 10 minutes. Then remove from pan onto a cooling rack. Cut the bread into slices and let slices continue to cool in the freezer while you prepare the next layer. In a large bowl, combine the cream cheese and butter. 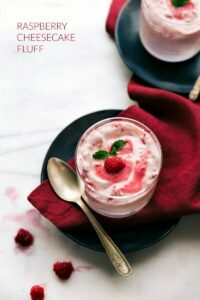 Using hand mixers, beat for about 2 minutes or until soft and creamy. Add in the sugar and eggs and continue to beat. Sift the flour and salt in another small bowl and then slowly mix in with the wet ingredients. Continue to beat and add in vanilla extract. Using a small and well shaped flower cookie cutter, cut out the flower in the sliced strawberry cake. Grease and flour the bread pan very well. Pour a very small amount (about 1/4 cup) of the pound cake layer into the bottom of the pan and spread it along the bottom. Then stick the flower pieces from the back of the pan to the front. Pack the flowers in tightly so cake can't seep between the layers. Pour the remaining pound cake on top so that all the flowers should be completely covered. 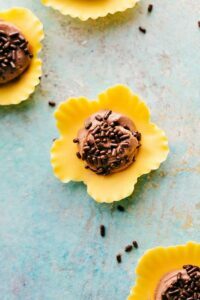 Use a spoon if needed to place the batter around the flowers. Be gentle so you don't ruin any of the flowers. Cook for about 60-80 minutes or until a toothpick (stuck in only the pound cake layer) comes out clean. This time variance is so large because of altitude differences. Let the cake cool for about 10-15 minutes and then remove onto a large plate or platter. Spoon the glaze over the cake generously. Using the cookie cutter as a guide for how thick your pieces should be cut, cut and serve. Chelsea, this cake is stunning. So vibrant and fun! I want to reach through the screen and hoard it for my own snacking. Pinned. Haha!! Thanks so much Jennie 🙂 And thanks for the pin! That is the most beautiful looking pound cake, what a fun surprise for a mom to cut into it and discover a flower inside! LOVE! As if poundcake weren’t wonderful enough. Haha exactly! 🙂 Thanks Jane! 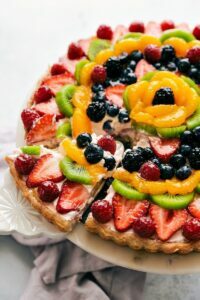 Perfect cake for spring! I made a Christmas tree version for the holidays, and had a heck of a time coming up with a cookie cutter that would work. I’m going to have to hunt down a few more small ones so I can try your cake, too! I’ve learned in life that not all surprises are good, but this one, yes, yes, yes!!! Just looking at this cake makes me smile, that popping orange inside. I’m afraid I might hoard it and not let people actually eat it because it’s so smashing! I love baked goods with surprises on the inside. 🙂 I tried this for Valentine’s Day last year with a heart shape in the middle, and it turned out terribly, haha! I love your tip about putting some batter in the bottom of the pan first because that totally would have helped. This is so pretty, Chelsea! Pinning! They are so fun! Oh I hate when recipes don’t work out! I’ve had a few fails with these cakes too actually haha. The tiny bit of batter at the bottom and small cookie cutters is what has worked for me. Thanks so much for the pin Beth! I can’t believe mother’s day is right around the corner! I wish you a very adventurous one, Chelsea! This is such a beautiful pound cake. Love the flavor of orange! oh my goodness!!! Just stunning!!!! I am actually baking a few cakes from Surprise Inside Cakes right now. . so I truly appreciate this. . so pretty!!!! So pretty! I’ve always wanted to try that. How cool!! 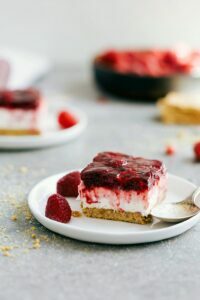 We’ll be spending Mother’s Day with my boyfriend’s mom, so we’ll have to try this if we have time!! I’m really surprised that the flower part doesn’t end up dried out after being baked twice – ingenious! Well I hope you enjoy it if you get the time! 🙂 It’s pretty amazing it doesn’t dry out getting cooked twice! How cool is that!! Love this idea and the fact that an orange cake mix is used too! This is such a cute pound cake, Chelsea! I like that you showed a pic of how you placed the flower cutouts. I’ve never made anything like this before so it’s nice to get a visual of how to do it. Pinned! Have a great week, Chelsea! Thanks so much Julie! 🙂 I hope you have a great week, and thanks for the pin! How stunning is this cake! I’ve never baked anything like this before. As long as it’s easy to prepare, I don’t mind waiting ;). Can’t believe mother’s day is just around the corner! My mom is in Korea so I won’t get to bake her anything…I sure do miss her terribly. I would’ve never known the difference! I think both loaves look incredible. I’ve always wanted to try this trick, especially once I figured out the middle wouldn’t dry out (I still think that is the coolest thing 🙂 ) What a gorgeous Mother’s Day treat, I love the orange! Thank you Mary! 🙂 It’s amazing how the center doesn’t dry out! Thanks again, I hope you are having a great week! Love the design you chose for inside the pound cake. And the colours scream spring! This cake is absolutely gorgeous! It looks so perfect for spring! This is SO gorgeous Chelsea!! How cute!!!! Love love love this! so pretty! I just did one of these cakes but with yoda (from star wars) inside. Tricky, but it came out! your flower inside is really perfect for mothers day! What a HAPPY little cake 🙂 Love it!!! This is such a unique idea! Pinning it! !